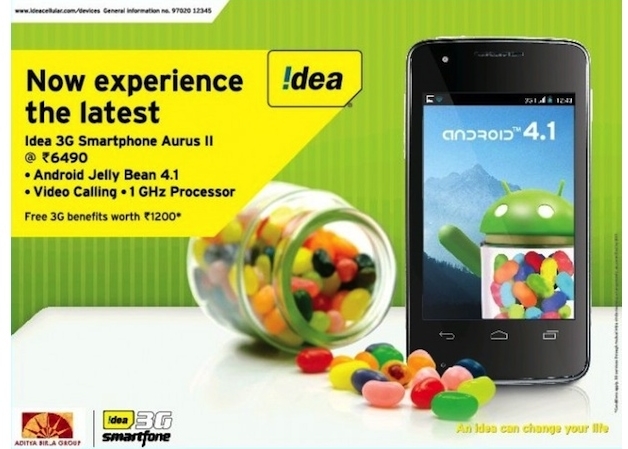 Idea telecom company launched its new Dual SIM smartphone Idea Aurus 2 with Android 4.1 Jelly Bean operating system. Idea targeted users who like to switch from 2G to 3G network at budget price tag. Idea also recently launched Idea Zeal 3G dual SIM Android 2.3.6 Gingerbread operating system for Rs. 5,390. Idea Aurus 2 come with 3.5-Inch capacitive multi touch screen with 320 x 480 pixel screen resolution and 262 K colors. Dimension of this smartphone is 115 x 61.2 x 12.2 mm, 122 g weight and available in Raven black color variant. The smartphone powered by 1.0 GHz single core processor with 512 MB RAM and 1400 mAh battery. It come with 3G, Wi-Fi, Bluetooth, and USB connectivity options. The device sports dual cameras, 3.2 Megapixel autofocus rear facing camera with digital zoom and 0.3 Megapixel VGA front facing camera with video call facility. It has 4 GB of internal storage space and it expandable up to 32 GB via MicroSD card slot. 3.5 mm Audio Jack and stereo headset available.It's 1400 mAh lithium rechargeable battery give 254 hrs standby time on 2G network and 350 hrs on 3G network, 5 hrs on 2G network and 6 hrs on 3G network, 35 hrs Music playback with SIM and 29 hrs Music playback without SIM.